Bruce Willis' career took a good turn once he realized he would never be the huge action star that he (or audiences) thought he could. Willis (Sin City, Hostage) began to get a bit choosier with his films, taking risks with roles, and turning into a much more interesting actor than he would have been. Now, when Willis does an action movie, one watches it expecting something a little bit different from the norm. Add in Mos Def, another actor who has a pretty good track record for choosing roles, and 16 Blocks looks like it could have a lot of promise. The premise is interesting, and probably the only unique aspect of the movie. 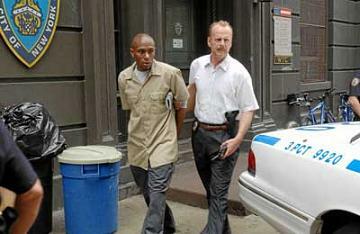 New York City policeman Walter Mosely (Willis) has to transport prisoner Eddie Bunker (Def, The Hitchhiker's Guide to the Galaxy, The Woodsman) sixteen blocks to he can testify. Sounds pretty easy, right? Well, director Richard Donner (Timeline, Lethal Weapon 4) and screenwriter Richard Wenk (Just the Ticket, Vamp) make sure they throw in enough wrenches to make things interesting. The primary obstacle is that Bunker is testifying against some crooked cops who will stop at nothing to make sure he never makes it there. Mosely and Bunker have to avoid these cops amidst painful New York City gridlock. Worse, Mosely is a washed up cop. He's drunk, has a bad leg, and doesn't really care about much except where he can get his next drink. Willis is suited to play this flawed character. He brings a sense of depth to Mosely, who was a good cop once. Once he realizes that Bunker is testifying against cops, he sees a successful transport of Bunker as a sort of redemption for his current sorry state. Over the course of the film, he gets more clear-headed, dusting off his unused brain to come up with increasingly clever ways to elude Frank Nugent (David Morse, Dreamer: Inspired by a True Story, Hearts in Atlantis), their chief protagonist. For his part, Def injects some empathy into Bunker, a motor mouthed con who wants to be a baker. Bunker manages to be both endearing and highly annoying. The concept does lose much of its steam as 16 Blocks progresses. Mosely is a smart cop, but Donner and Wenk through in generous helpings of luck to help the two along. Part of the reason for the decline is that the film is too long. The extra length means a few additional sequences where Mosely and Bunker try to avoid the bad guys. There are too many standard action movie sequences of shoot-outs and car chases. 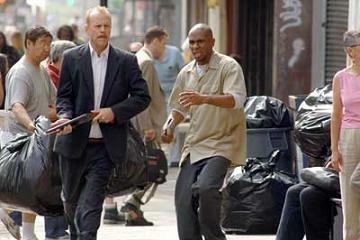 16 Blocks works best when it is quieter, and when Donner creates a sense of dread and claustrophobia. The excessive use of the loud action sequences ruin this mood, turning 16 Blocks from something different to the same action movie everybody has seen multiple times. 1 hour, 45 minutes, Rated PG-13 for violence, intense scenes of action, and some strong language.